With all the pressures and influences of today's world, Christian moms worry about their little girls and how they will grow up. Quality time between a mom and a daughter can be the greatest protection against the world's pressures to make a girl mature too quickly. 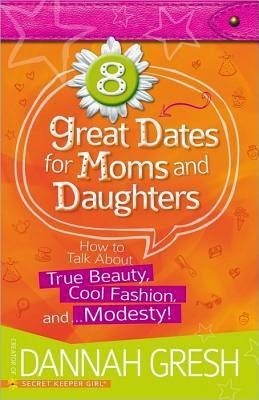 Knowing this, Dannah Gresh, popular speaker and founder of the Secret Keeper Girl conferences, has developed a host of dating ideas to help moms invest the time needed to deeply connect with their daughters. The power of true beauty--what makes a girl beautiful? Hair, makeup and clothes--who should be your model? Here's the secret to bringing up healthy, grounded, and spiritually rich girls! I'm in denial I think. I know my littles is growing up, but it's hard to think of her getting older. I still think of her as this cute, sassy, little toddler. Sadly those days are gone and we're right on the edge of preteen! Yikes! I'm so not ready for that. Any help in trying to combat the future battles she might face is something I'm always on the hunt for. I want to be prepared. My littles still may not be in the age range of this book, but after reading it, it helped in getting a game plan ready for when she gets there. With today's constant bombardment of image and looks and products and just of things to change a girl from who she is to something else, it's a battle and a young impressionable mind is the battlefield. I remember when I was that age, it wasn't fun then, I can't imagine now with all of this technology. Self esteem is so important and keeping it positive and on God's designed path can be tricky. Dannah Gresh broke down each section well and she kept everything right to the point. You don't want to swim in pages of overflowing info when wanting to talk to your kid. This was spot on. Not too little and not too much. With each section there is also activity pages. They were good in jumping into topics and guiding them where they need to go and they were wrapped up in scripture that fit with that particular section. The activity ideas seemed like great ideas. Girl days are important, at least to me, they offer a little more fun in life and they don't have to be expensive. The ideas offered ranged from going to have a tea at a restaurant to giving facial at home. Each mommy/daughter date of course worked with that subject. I enjoyed this book for all of the different ideas. I think it can be a very useful tool for moms and dads (who can be help with a couple of things that were mentioned). I will be hanging on to this for future reference. Dannah Gresh is an author, a speaker, and the creator of the Secret Keeper Girl live events. She has sold over 1.3 million books, including Six Ways to Keep the "Little" in Your Girl, A Girl's Guide to Best Friends and Mean Girls (coauthored with Suzy Weibel), 8 Great Dates for Moms and Daughters, the bestselling And the Bride Wore White, and Lies Young Women Believe (coauthored with Nancy Leigh DeMoss). She and her husband have a son and two daughters and live in Pennsylvania. www.purefreedom.org.